I grew up in Wellington, and I’ve always wanted to do beauty therapy. I was interested in beauty from a young age and even started wearing makeup at 7 years old! What I love about being a beauty therapist is being able to fix people’s skin, and building one-on-one relationships with clients, where you can really get to know them. I decided to study at Elite as it is known for being professional, and I wanted to study somewhere I would be supported in my learning. What has it been like on campus at Elite? I’ve loved every moment at Elite. I’ve learnt so much, and found that there is always more to learn. I have loved learning about all of the treatments, but particularly loved learning facials and about how the skin works, and massage and nail treatments. I like how as a beauty therapist you can focus on your client and provide them with a treatment they enjoy, and I love being able to see the client get great results. 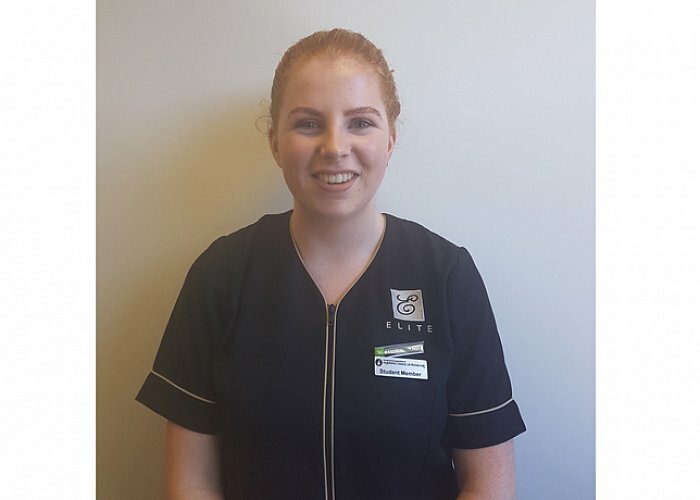 Elite has given me a good understanding of what to expect in the workforce, and has taught me lots of different techniques that are beneficial for treatments. I am wanting to complete my internship at Ragdale Hall in the United Kingdom, and want to travel and work overseas. My goal is to work my way up to a salon or spa manager level, and eventually I would like to own my own salon. My end goal is to have two salons either in Wellington or overseas.